I am happy to share with you more about Jiang Bang Han, he is the person in the video and I even took a photo with me and you can see from the photo that he has lost weight and look even younger and fresher. "...I used to be a chef and had a happy family. After the heart surgery in mid-September of 2006, I had lost my job. 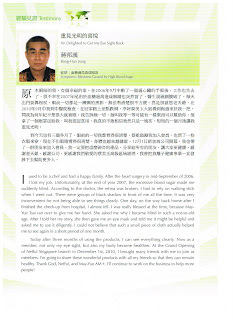 Unfortunately, at the end of the year 2007, the excessive blood sugar made me suddenly blind. According to the doctor, the retina was broken. I had to rely on walking stick when I went out. There were groups of black shadow in front of me all the time. It was very inconvenient for not being able to see things clearly. One day, on the way back home after I finished the check-up from hospital, I almost fell. I was really blessed at the time, because May-Yue Tsai ran over to give me her hand. She asked me why I became blind in such a not-so-old age. After I told her my story, she then gave me an eye mask and told me it might be helpful and asked me to use it diligently. I could not believe that such a small piece of cloth actually helped me to see again in a short period of one month. Today after three months of using the products, I can see everything clearly. Now as a member, not only my eye sight, but also my body become healthier. I am going to share these wonderful products with all my friends so that they can remain healthy. Thank God, Nefful, and May-Yue AM+. I'll continue to work on the business to help more people!...." If you know anyone who might be suffering from the same symptoms as Ah Han where his blindness was caused by High blood sugar, please let them know that there is still hope. I am more than willing to share more about Nefful's negative ion clothing to you or your friend, do contact me for more information.